One of the goals we have in staying in Italy for some time to come is to continue exploring our own backyard, i.e., Roma and environs. We’ve enjoyed some less-visited sights over the past three years, and continue to look for new ones. Afterall, una vita non basta! St. Peter’s from the inside. A view from the garden, where the Pope takes his daily walk. Early last week a new tour was announced in the Italian press: Vatican by Train. That got Ric’s interest pretty fast. According to the press, the tour, called “Vatican by Train Full Day” would run only on Saturdays and the first run was September 12. We could be on-board for the maiden voyage! With the exceptional opening of the Barberini Gardens and of the Museum of the Apostolic Palace, the Pontifical Residence of Castel Gandolfo welcome the public at large. Visitors who book the Vatican by Train will have access to the Vatican Museums, the Sistine Chapel, the Vatican Gardens and to the botanical and architectural wonders of the Pontifical Residence, known by as the “second Vatican”. Beautiful lawns fall away toward the train station. Hard to imagine all of this is inside Vatican City. Leaving home about 06:30, we arrived at the museum entrance a few minutes before 8:00, fortified by cappucino e cornetto at a nearby bar. It was clear lunch would be a long way off and we had miles to go before we ate. We were admitted quickly, as promised with our voucher. Exchanging it for tickets and an audio guide took a few minutes, but by 8:25 we were outside the Pinacoteca, which we had decided would be our focus. There is no way one can “do” the Vatican Museums in less-then-two hours. A few people we spoke to later in the tour tried a mad dash to the highlights such as the Sistine Chapel and Hall of Maps, but everyone eventually realized this was not a best-of-the-Vatican tour. 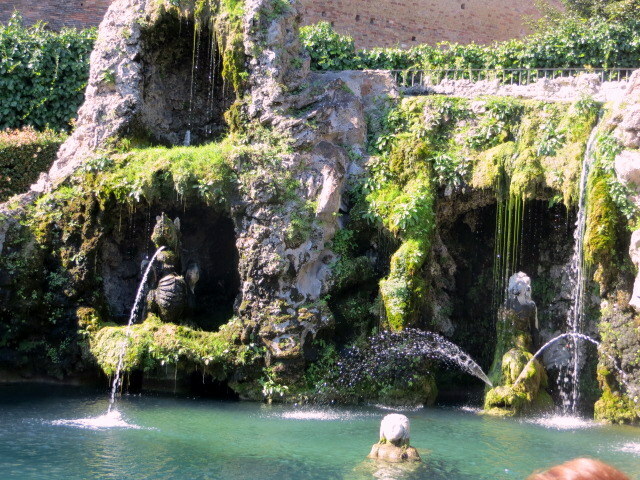 Fountain in the Vatican Gardens, reminiscent of Villa d’Este. Our decision to focus on the Pinocateca was fortuitous: We were completely alone for at least 20 minutes. Just Ric and me, fabulous works of art, and a dozen guards hunched over their smartphones. (Whatever did museum guards do before they had smartphones?) Some tour groups arrived, stopped at major works then moved quickly on. We took our time, saw the entire gallery, then had a brief rest before the garden tour. If you ever want to be alone in the Vatican Museums, head for the Pinocateca at opening. Under clear blue skies and warm-not-hot sun we were escorted through the Vatican Gardens by a group of uniformed guides and a number of “suits” and journalists. The museum officials were shepherding the inauguration carefully, ensuring it went smoothly. And it mostly did. Bougainvilla still in bloom, the Vatican Gardens. Our garden tour was also audio-guided, and we had a wee map with audio points described, but it was difficult to know where our group of about 100 people was and when we should punch up each number. Still it was beautiful, not at all what I expected, and while not encompassing the entire tour (which according to the website is 2 hours long) it was a good overview. We ended at the Vatican train station, a seldom-used and closed-to-the-public relic of a prior era. Thanks to Papa Francesco, more of the Vatican properties are being opened to mere mortals and the chance to take the train out of this station was a strong motivator for us. Not the steam train the media portrayed…. We expected a steam train. 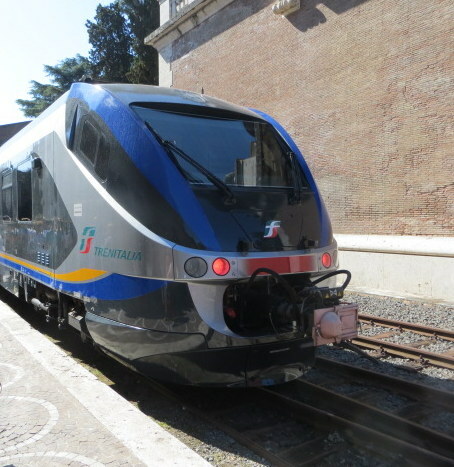 All the news media featured a vintage train, but on arrival we found a modern Trenitalia train of the type used on the FR lines. It was fine, comfortable and air-conditioned, but not the historic experience expected. I have to wonder if there was another train that day, but all of the articles I’ve found were written before the 12th and so I think the pictures are “file photos” and certainly not from the event we attended. We had a nice ride to the station at Albano Laziale, where buses met us and ferried us through narrow streets and up the hill to the entrance to the gardens. There, we boarded a trenino to tour the estate, again with audio guide. Absolutely stunning is all I can say. 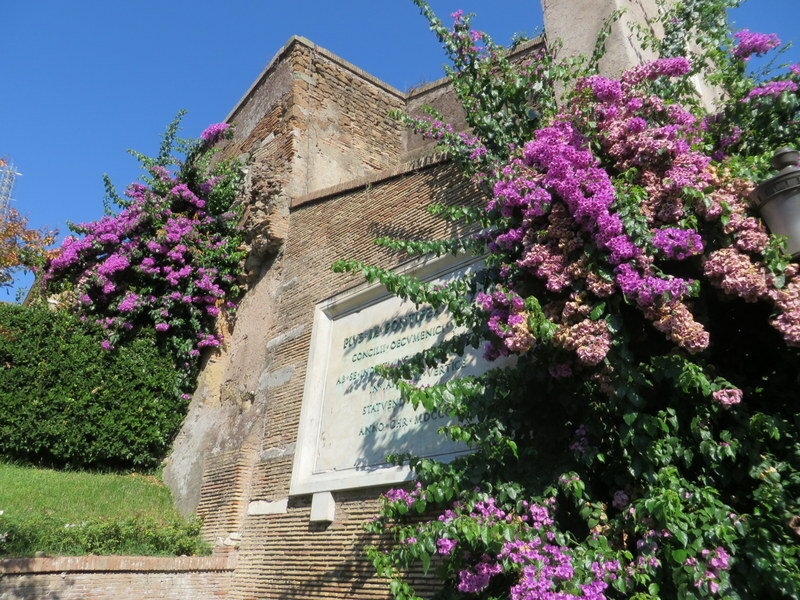 I had no idea Domitian had a summer palace here, but then why wouldn’t he? The history is, as with almost any grand villa in Italy, long and complex. What remains is a place of beauty comparable to Versailles. Some is wooded, some planted in formal gardens, and there is a farm. Did you know the Pope has a farm? Chickens, white goats, cows, bees: everything one needs in a self-sustaining estate. Click on any photo to enlarge it or for a slideshow. The trenino that ferried us through the Pope’s gardens at Albano. 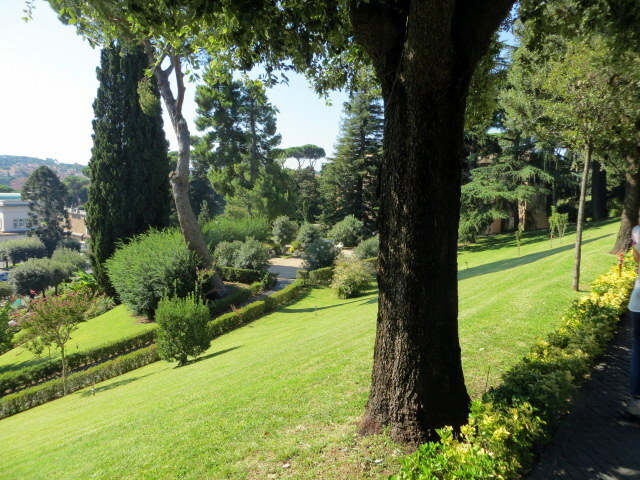 Gardens at Albano-Castel Gandolfo. Confusion on the location but not the beauty. Papa Francesco’s coat of arms, gardens at Albano. The Pope’s cows, Papal Gardens. Wrapping up about 14:40, we had three hours of free time. We set off to find a restaurant along the lake, where we had lunched a couple of years ago. But wait, where the hell was the lake? Pulling up Googlemaps we found we were in Albano Laziale, not Castel Gandolfo. Duh! Not close to the lake, we started wandering the town, which was mostly closed for la pausa. Not a lot of restaurant options we could see, but peeking down a little alley Ric spotted a trattoria. From where we stood it looked closed, although someone was inside sweeping up. “Siete aperti?” I asked. “Sí! Accommodatevi!” We took a cute table on the patio just as a group of Americans we knew trooped in. They, too, had been surprised by ending in Albano Laziale. They had a reservation for lunch 3 km away in Castle Gandolfo! Feeling slightly less stupid for misunderstanding, we relaxed and prepared to enjoy lunch. 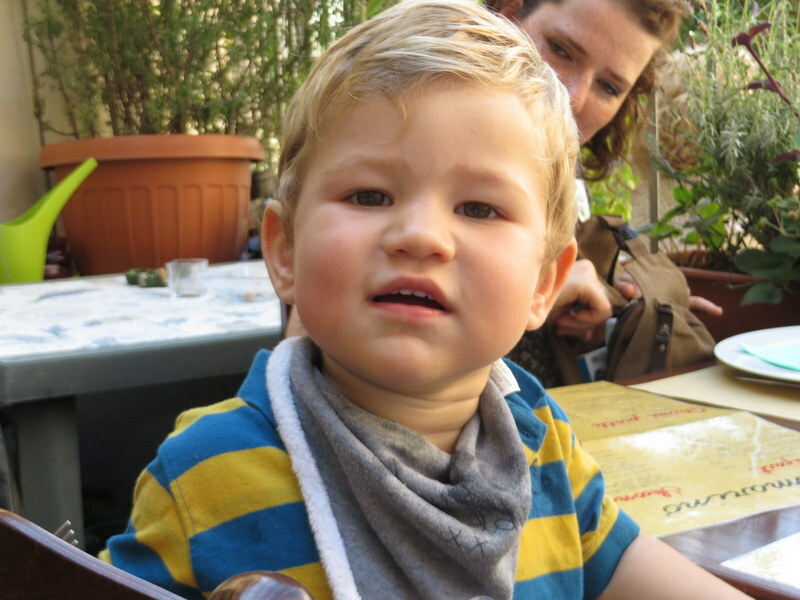 We were fortunate to have a little family from the U.K. join us at a neighboring table and engaging in conversation we discovered they had expected to end the tour at the Apostolic Palace in Castel Gandolfo. Surprise! Perhaps all of the English-speakers misunderstood? Maybe the Vatican website was less-than-clear? Nonetheless, I can highly recommend Trattoria Rosmarino should you make the trip to Albano. Cin cin! At Trattoria Rosmarino. Highly recommend! A long lunch ate up the free time (pun intended). 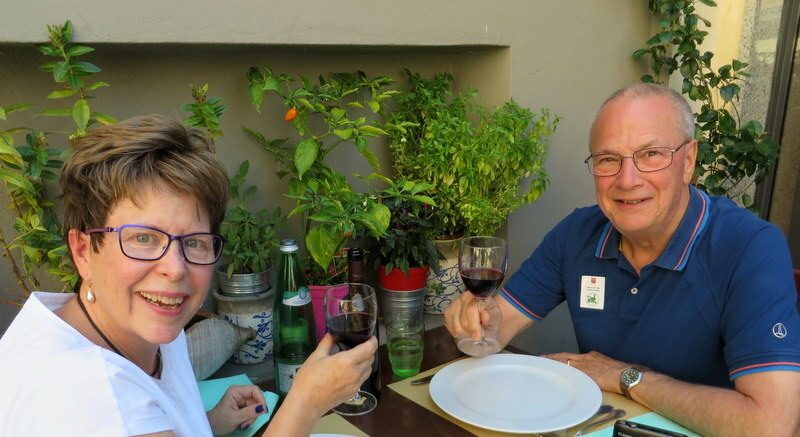 There are a number of ruins and sites in Albano for the more industrious tourist, but we had been on-the-go since dawn with not much energy left, so a luxurious lunch was perfect. Back on the shuttle bus before 16:30, we arrived at San Pietro Station just in time to get a train to the tram to go back home, another adventure in public transportation for us. Isaac, our dining partner at Rosmarino. We were very confused about the relationship between the estate we toured in Albano and the Apostolic Palace at Castel Gandolfo. 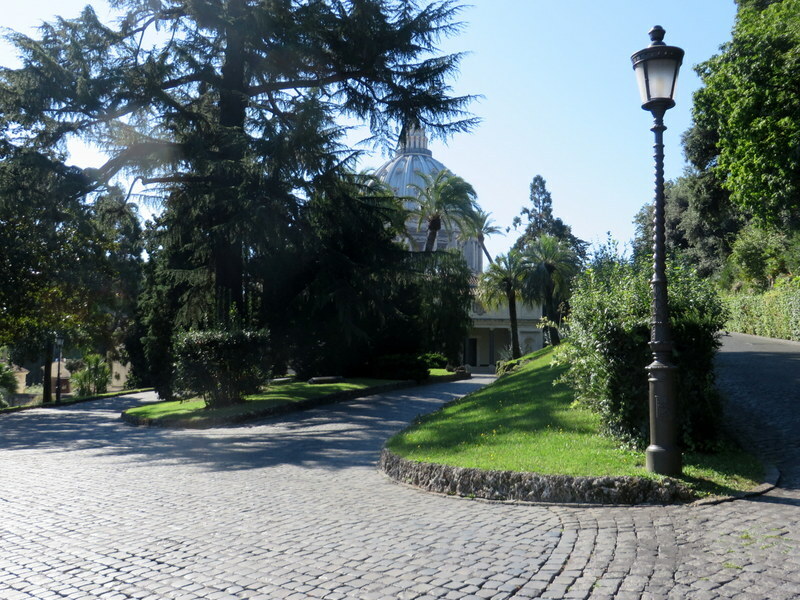 A little map-based research showed they are on the same property, but the gardens are accessed by the public through Albano, and the Apostolic Palace is at the other end, the north end, closer to the lake. One can visit the Apostolic Palace, any day but Sunday, and only in the morning, and apparently only through the month of October, presumably to be revived in the spring. I suspect another day trip to the area is in our near future. For more information on all of the tours, go to the Vatican’s Online Ticket Office. This is a great day trip away from Rome…less crowds! I tell friends visiting Rome that they should take the Vatican Gardens tour. It’s the only real way to see what life is like in the world’s smallest country. Forget the flowers. Watch the priests play pickup soccer games and the nuns gossip under shady trees. I even saw Pope John Paul II cruise by in his Popemobile once. I understand there is a tour that covers a larger area than we walked that day. I think I’d like to go back a few times a year. The gardens give a bit of a glimpse into a unique environment. “The Pope’s cows” – that has to be one of my favorite captions of all time! Happy to inspire return visits! That is quite interesting about the Pope’s farm. I loved that little white train taking you thru that area. And the long lunch…..that sounded so relaxing! I was sitting next to a little old Britich lady and she quipped, “Why he’s just like Prince Charles: Self-sufficient!” I wonder if those eggs make it to the guest house in Vatican City where Papa Francesco lives? This sounds like an amazing and very full day! More reason to return to Rome. Yes, another in a long list of reasons to return. My list gets longer not shorter, even though we live here! Thanks for reading!